Packers @ Lions Pregame « Roll Out the Quevedo! Flex scheduling would have moved this game to Monday night! Flipping through my Sunday Ticket channels Sunday, I was shocked to see the Lions-Browns game was actually on. I knew it was blacked out in Detroit, but I would have figured the NFL could have done everyone a favor and blacked it out entirely, or even cancelled it. As it turns out, it was the most entertaining finish of the weekend. In fact, it’s the Game of the Week replay on the NFL Network this week. If you’re a Lions fan, you still had more negatives then positives. The positive is you won and Stafford was NFC Player of the Week. The negatives are: you gave up 37 points to a team that hadn’t scored 37 points all season, you had 3 turnovers and a safety, and your franchise QB almost had to cut his left arm off at the shoulder following the game. 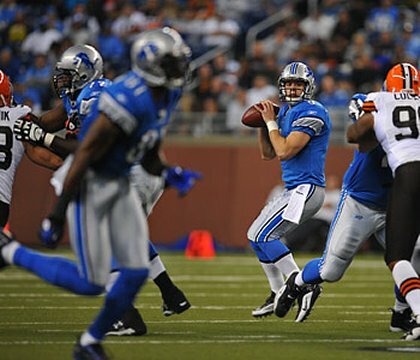 The loss of Stafford this week hurts the Lions a lot more then the two defensive injuries the Packers sustained Sunday. As I have stated earlier on this site, so much of professional sports is showing up. The Packers learned their lesson three weeks ago, so there is no chance in my mind that they think they can coast through this game, even with Culpepper at the helm. On the other hand, there isn’t any real reason to be worried about this game. The Lions slashed one of the worst defenses in NFL history. Culpepper would have slashed the Browns. Big deal. I’ll tell you the real matchup of the year: Cleveland vs. Washington. Too bad they’re not scheduled. Who gets him Sunday? Woodson? Williams? 1) Contain Calvin Johnson. He was inactive in the first game, and he’s coming off a 7 catch, 161 yard performance. This is a monstrous test for Dom Capers and the newly configured secondary. Normally, this would be Al Harris all day. The problem now is if you roll coverage over to help on Johnson, Pettigrew, their rookie TE, could have a field day. If you noticed last week, every time Woodson went off of Vernon Davis, they threw him the ball because he was WIDE OPEN. We’ll see how Capers defends this mess. 2) Continue the offensive balance. Last week, Green Bay had 32 rushes and 45 passes. For the Packers, that’s balance. Goal for Thursday is to be a little better than last week. Needs to happen to make up for the losses on defense. 3) Get off to a great start. If the Browns can score 24 points in the 1st quarter, just think what the Packers are capable of. Three things working in Green Bay’s favor here. 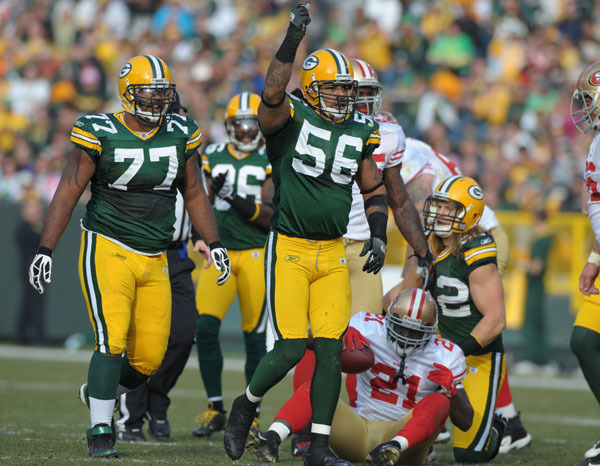 Last week, the Packers had 17 first downs in the 1st half, the 49ers had 1. That stat is real. Secondly, the Lions defense is absolutely brutal; 31st overall, 32nd against the pass. Thirdly, Packers are 1st in the NFL in turnover margin, the Lions are T30th. On paper, the halftime score should be 67-0. 4) Build defensive chemistry with the new group. These guys need to be on the same page and every one of them needs to step up their game. This is the perfect game to get started with that. Unfortunately, we will be subjected to more Jarrett Bush then is recommended by the World Health Organization. Hopefully, he doesn’t infect the entire Packer Nation. Are there shots for this? Yep- whiskey.